For Brandy Protz, a dream became reality when she was crowned the 36th Miss Indiana State University. "I couldn't believe it when I won," said Protz, a senior from Vandalia, Ill. "I've dreamed about being Miss ISU from the moment I knew I was going to go here." Protz competed against 12 other women in the Miss Indiana State University Scholarship pageant on Nov. 12 in University Hall. The pageant determines who will represent the school in the Miss Indiana statewide competition. "For Miss ISU, we're looking for someone to be an ambassador for the university in a variety of ways," said Freda Luers, director of campus life and co-coordinator of the pageant. "The woman who is selected to represent Indiana State is selected upon her appearances and her community service." 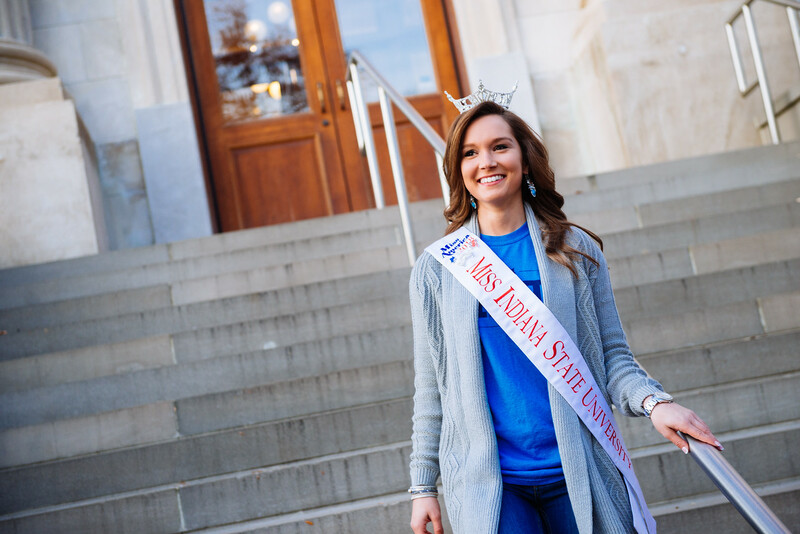 Since the pageant's inception, the Miss Indiana State University pageant has awarded scholarships to women based on their leadership and involvement and remains a special experience for its contestants, who form bonds in the leading up to the event. "It was so much more than I expected. I'd been practicing with the girls since September," Protz said. "Just being around other people that are so driven and talented, I'm so impressed by them." To prepare for the competition, Protz leaned on friends and mentors for advice, including last year's Miss ISU, Tiarra Taylor. Taylor and Protz will compete together at in Miss Indiana in June. Protz also counted on her grandmother for advice. "My grandma always listened to me when I was nervous and told me, ‘Whatever happens is what's meant to be, so just roll with it and it'll be okay,'" Protz said. One of the qualities Miss ISU must possess is service in her hometown. For Protz, being crowned 2016 Miss Fayette County helped her gain knowledge of her hometown, as well as the importance of agriculture and solidified her intent to participate in the Miss ISU pageant. "That was an awesome experience," she said. "It gave me the confidence to keep going. The experiences I had definitely translated to competing for Miss ISU." Throughout her four years at State, Protz has been heavily involved with Student Government Association and Sycamore Leadership Coalition, which she served as director of academic affairs and is now chief of staff. Protz has also been involved with Shell's Eco Marathon as a team manager, Sycamore Racing and is a President's Scholar. "Brandy will excel in her ability to interact with the community because she's so familiar with campus. She has her connections already made here with the racing team and Student Government Association, so her having the title of Miss ISU will allow her to continue developing those relationships," Luers said. Protz said she is grateful to represent a campus community that has helped shape her into her best self. "I love Indiana State so much. I've been able to do so many things I've loved here, and Indiana State has so much to offer to so many different kinds of people," she said. 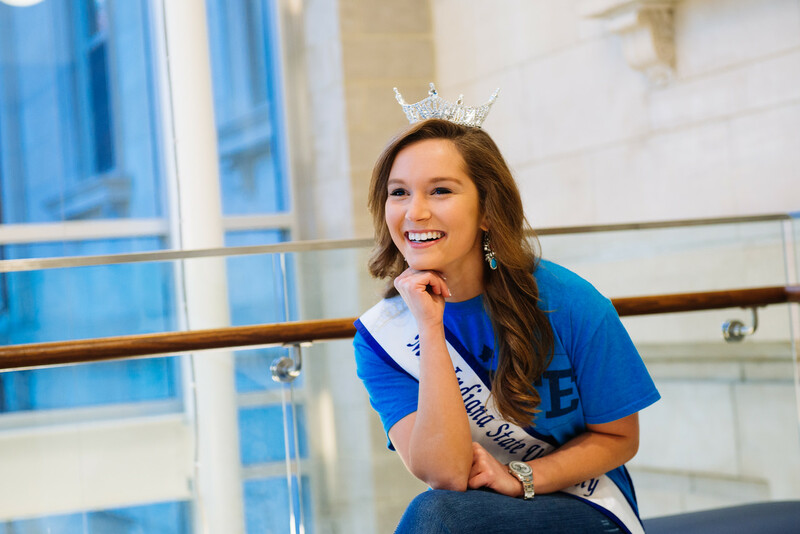 "I wanted to put myself out there and have that chance to be an ambassador in the form of Miss ISU." The experiences gained at State are what Protz is most proud of. "The many unique life experiences have molded me, and the personalities I get to work with will help me in the future," she said. From drag racing to excelling in higher education, Protz has learned to smile in the face of adversity and is adamant about others doing the same. "I have a strong passion for helping others realize they have potential. Success is unique to everyone," she said. "It's also important to promote everyone having the chance to be successful in their own unique way." Being Miss ISU will allow her to support her platform through public appearances and speeches. "Her ‘talent' is a monologue about her passion, her platform ‘You Can,' or ‘You can do anything.' She can sing, she can dance, but she's a racecar driver. Her whole persona is confident in who she is, and she's going to be a really good representative for Indiana State," Luers said. Protz, an athletic training major, plans to continue her education as a physician assistant after graduating. "After school, I'll roll with the punches and see what life brings," She said. "My dream job right now is to work with orthopedic surgery." Protz said the opportunity to represent Indiana State is a role she will cherish. You might see her at campus events, from the Polar Plunge in February and the Special Olympics this summer. "I am so thankful for this opportunity and so thankful for everything Indiana State has done for me," she said. "I really take pride in all the unique experiences I've had." Brandy Protz competed against 12 other women to win the Miss Indiana State University Scholarship pageant on Nov. 12 in University Hall.